Call or stop in today to reserve your spot. Space is Limited to 6 per class. Class will be held in two sessions. Four different class sessions to choose from. 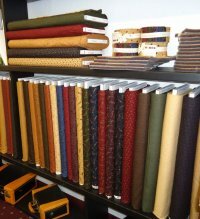 Purchase your supplies for this class from us and receive 10% off. Class Fee due at time of registration. Pattern will also show you how to make four matching placemats on your own. Additional supplies will be needed for you to complete those if you wish. 1st Person who comes in and chooses the Bolt of the Day will get 20% OFF that bolt. Then for the rest of the day that bolt will be 20% OFF for everyone! Any regular priced bolt in the store is eligible for Bolt of the Day savings. 1 Yard Minimum cut is necessary to declare the Bolt of the Day. Sewing Therapy will now have Wednesday Winners! Sewing Therapy is held every Wednesday afternoon from 12-4pm. Stop in for a little "ME" time and work on whatever project you have going. Starting in April we will have everyone who comes to Sewing Therapy sign in and at the end of the month one lucky person will win a prize. 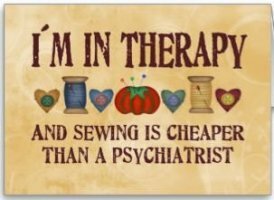 Remember Sewing Therapy is free to attend and sew much fun! If you are planning on coming please let us know in advance if you can so we can make sure we have a work station set up for you. We're talking Quilt Backs that is! 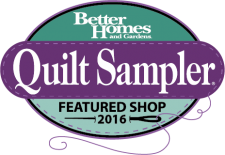 Another special for You from "ME"
Bring in your Finished Quilt Top to purchase the backing on any Thursday and get it for 20% OFF. Must bring in the Finished Quilt Top to get the 20% OFF.